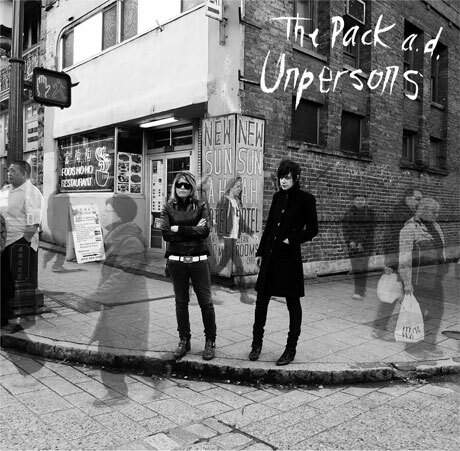 Two-headed Vancouver garage rock unit the Pack A.D. return with their fourth studio album Unpersons on September 13. But you don't have to wait until then to hear it, as the entire record is available to stream right now on Exclaim.ca. Unpersons shows off the confidence that bandmates Becky Black and Maya Miller have gained since their previous records. Featuring fuzzy guitars and pounding drumbeats, the album is a solid soundtrack to a bad break-up and a giant middle finger to anybody who's wronged these girls in the last little while. First single "Sirens" sets the tone for the album. Described as "the album to vaporize those who shall not be named, and erase any trace of their existence with a dense cloud of fuzz-bomb riffs, tribal rhythms, and hard (legal) drugs," the record challenges anyone to mess with the Pack A.D. again. Spouting lines like "Well, I drank two bottles of wine / And then I threw up and felt just fine" (from the track "8") illuminates the harsh humour that permeates the majority of the album. And while they've established their own sound over the last few years, the Pack A.D. have truly stepped it up a notch this time around with their gutsy, honest rock'n'roll. Listen to Unpersons below and grab the album on September 13 via Mint Records.